OnSwipe competitor and TechCrunch Disrupt finalist Pressly is launching today with its first major publisher, Canada’s largest newspaper The Toronto Star. Like OnSwipe or even iPad mag Flipboard, Pressly’s service is designed to give traditional Web content a makeover by making it more tablet-friendly. But in Pressly’s case, it’s not about re-packaging content as a native app – instead, it uses a combination of HTML5 and customizable templates to allow publishers more control over the tablet browsing experience. Pressly is also now offering something else that makes it different from OnSwipe – a consumption model for monetization. 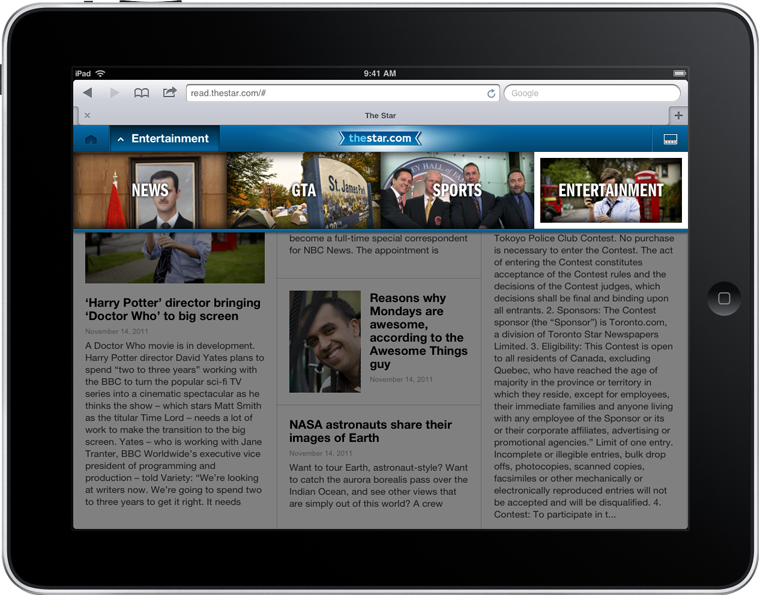 Before, like OnSwipe, Pressly would take a cut of the ad revenue. Now, publishers have a choice between that and something like $1 per every 1,000 swipes. This figure is not yet in stone, it should be noted. As for its launch on The Toronto Star, things are going fairly well. Since its debut at 6:30 PM EST last night, Pressly has seen 180,000 flips at an average of 22.6 flips per person. The company says its goal is to reach 1 billion flips per month over the next twelve months. It may get there, too, thanks to a couple of other publisher partners whose launches are just ahead: The Economist Media Group is debuting a Pressly-built site in a couple of weeks and soon after a news-focused NBC property will follow. Tablet readers who want to see Pressly in action from their iPad or Android tablet can do so now by visiting read.thestar.com.